As she was growing up in Oelwein, Iowa, Peladija Woodson-Diers listened to her parents’ stories about their lives. She became so fascinated by their experiences during WWII, she began voice recording their stories. Eventually she decided to share with others her parents’ incredible and tumultuous journey. The result was Triumph Over Destiny published in 2014, which repeatedly earns four- and five-star ratings by Amazon readers. Karoline Rink lived in the small Alpine village in Bleiberg, Austria. In 1938, she worked alongside her father in the lead mines. Woodson-Diers tells how her mother at age 15 was forcibly kidnapped from her home by the Nazis. After she was taken, Karoline was placed as a laborer in a large restaurant in Germany, and eventually earned enough privileges to meet and marry a Nazi Luftwaffe pilot. They had two daughters and lived in Germany until her husband, Hinrich, died of tuberculosis in 1944. Karoline continued to live with his parents after Hinrich’s death. After the war ended, she eventually met and married a former Yugoslavian POW, Djura. Djura’s and Karoline’s love affair and turbulent journey continued on long after the war ended in 1945. They eventually emigrated to Oelwein, Iowa, in 1951, where Woodson-Diers was born. The author hopes to have Triumph Over Destiny translated into German. The book ends with the couple’s emigration, and Woodson-Diers plans to write a sequel about her parents’ life in America. After earning her bachelor’s degree at UIU, Woodson-Diers received a master’s in social work and today is a licensed independent social worker. She continues her book tour and discusses her book at numerous area libraries. 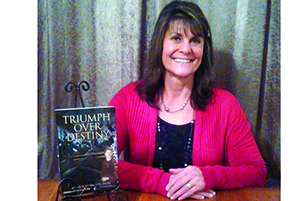 Triumph Over Destiny also can be found at online retailers in paperback or ebook form.